18 November 2010, at 9:41a.m. 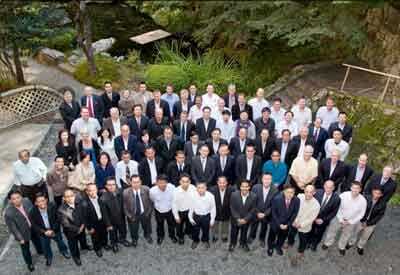 JAPAN - The 7th Ross Asian Association (RAA) Meeting recently took place in Kyoto, one of the oldest and most historical cities in Japan. The annual event was attended by 63 representatives from Ross GP distributors and customers from 19 countries of the Asia and Oceanic region. They were joined by 30 personnel from the continually-expanding Aviagen customer service team for the market. The meeting is a platform for discussions and presentations to consistently improve the Ross 308 product performance in all generations, to enhance the profile of the Ross brand and to plan for the future growth of the industry in the region. The main focus of the event was on poultry economics and included presentations on chicken economics, Asian market trends and the evolution of agriculture to feed an ever-expanding consumer base. A mix of Aviagen personnel, including Bob Dobbie, President of International Business, Bruce Evans, Regional Technical Manager and Dominic Elfick, Geneticist, and guest speakers, such as Gordon Butland, International Poultry Consultant, Jittin Udnoon, CP Indonesia and Jim Johnson, Food Chain Partners Worldwide Ltd, presented valuable insights into important aspects of the poultry industry. Sam Kikuchi, President of Nippon Chunky, the local Ross distributor, gave an overview of the company's growth and the success of the Ross products in Japan. The social programme provided an opportunity for delegates to experience traditional Japanese entertainment and dining. Bill Souther commented: "The meeting gives delegates and Aviagen personnel a unique platform to meet industry peers and share experiences and common concerns and plan for the future of the industry for the next five, 10 and 15 years. We have a common goal of ensuring that Ross products continually perform well and add value to our distributors' and customers' businesses. "The presentations all shared important business advice – to name just a couple, Jim's information on the importance of integration was extremely well received and Keith Lewis' insights into the US industry and its focus on Asia were very valuable. "It was a great pleasure to welcome old and new distributors and customers to the Association which has been an ever-increasing success since its formation nearly 10 years ago. We have a wonderful forum in this yearly meeting to jointly plan for the future of this growing region and our industry." Suping Sutanto from CP Cibadak, Indonesia, added: "It is of great value to me to have the opportunity to meet other Ross GP distributors and customers from the region and the Aviagen team at the RAA meetings. I always find it beneficial to be able to meet industry peers to exchange our experiences and learn from each other. I have made many friends over the years and always look forward to catching up with everybody." Chris Turner of La Ionica Poultry, Thomastown, Victoria, Australia, attended the RAA meeting for the first time and summed up his experiences: "It was a wonderful first meeting for me and I really enjoyed the venue and getting to know the different personalities from the Ross family in Asia and Oceania. Business in this region is so multi-faceted and the mix of presentations and personalities at this meeting brought this to light and stimulated lively discussions and interesting thoughts for all of us. I am so glad to a part of this association now."